The EUROCOM M5 Pro with NVIDIA GeForce GTX 980M and 970M graphics, 32 GB DDR3-1600 memory, 4 TB storage, a stunning 4k (3840x2160) 15.6” IPS display and an Intel Core i7 4710HQ processor also has a Trusted Platform Module 2.0 data encryption chip to provide a secure root of trust to protect data in computers from digital and physical attacks, theft or loss. “Security is important for anyone, now more than ever. Your credit card number, personal photos, diary, and intellectual property could all fall into the wrong hands without a proper security arsenal at your disposal. At Eurocom we try to give customers as much as we can to ensure they are adequately protected” Mark Bialic, Eurocom President. Enterprise, consumers, the public sector and others who want improved protection for their private and sensitive information can benefit from the TPM 2 in the EUROCOM M5 Pro. The TPM 2.0 specification includes updates to a number of TPM commands and adds support for additional cryptographic algorithms to further enhance security on the EUROCOM M5 Pro. We take security very seriously; Eurocom has coupled an integrated biometric fingerprint reader and a Trusted Platform Module to secure the M5 Pro from unauthorized access. The increased security, brought on by the TPM 1.2 can save organizations and individuals in IT management costs. “We are seeing a great deal of interest in the EUROCOM M5 Pro from professional users and game developers who need a secure, mobile system with proper capability. We feel the need to provide them with the utmost in secure computing to keep their information and livelihood safe and secure” Mark Bialic, Eurocom President. Experience great notebook performance with NVIDIA GeForce GTX 980M and 970M Maxwell graphics for advanced performance, unmatched power efficiency and cutting edge features. An Aluminum Alloy Chassis is used to offer a durable, rugged yet classy look while offering a very lightweight and strong 2.6 kg case that is just one inch thick. The EUROCOM M5 Pro has an Intel HM87 Express Chipset running the Intel Core i7 4710HQ processor with 4 cores, 8 threads running at 2.5 GHz with integrated Intel® HD Graphics 4600. Due to Hyperthreading, the four cores can handle up to eight threads in parallel leading to better overall utilization of the CPU. 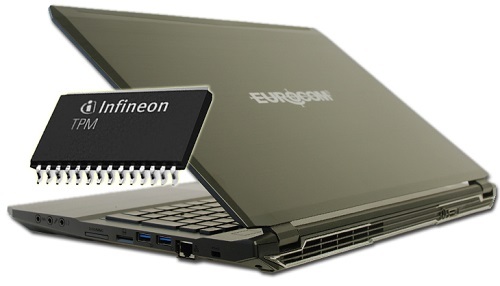 The EUROCOM M5 Pro has 4 memory slots ready for up to 32 GB of dual channel DDR3 1600MHz or 1866 MHz 204 pin SODIMM. Being fully upgradeable and configurable the EUROCOM M5 Pro supports 8 GB, 16 GB, 24 GB and 32 GB of memory via 4 or 8 GB modules.